I think this is the perfect meal for this weekend because we will likely all be getting up at different times and this is something where people can help themselves. It also requires no advance preparation other that buying everything and washing the berries. I love smoked salmon but I know it's not everyone's favourite, but this meal offers enough alternatives I think. I love making breakfast casseroles for a group too, but those are better for when family is visiting and we are all going to sit down together to eat. I also think that it's okay to splurge on the smoked salmon because it is a treat and breakfast is otherwise a relatively cheap meal to prepare. We get our bagels at Hot Oven Bakery in Bloor West Village and I will pick up the smoked salmon at De La Mer on Roncesvalles. I know other places have it, but I always like their selection. 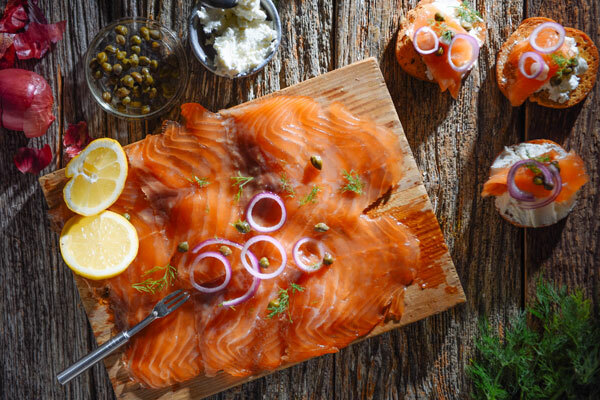 The trick may be finding fresh dill, but often De La Mer will have some and throw a sprig into your smoked salmon order. What a special way to start the day! Great menu!